Methylates methyl-accepting chemotaxis proteins to form gamma-glutamyl methyl ester residues. CheR proteins are part of the chemotaxis signaling mechanism in bacteria. Flagellated bacteria swim towards favourable chemicals and away from deleterious ones. Sensing of chemoeffector gradients involves chemotaxis receptors, transmembrane (TM) proteins that detect stimuli through their periplasmic domains and transduce the signals via their cytoplasmic domains [(PUBMED:9115443)]. Signalling outputs from these receptors are influenced both by the binding of the chemoeffector ligand to their periplasmic domains and by methylation of specific glutamate residues on their cytoplasmic domains. Methylation is catalysed by CheR, an S-adenosylmethionine-dependent methyltransferase [(PUBMED:9115443)], which reversibly methylates specific glutamate residues within a coiled coil region, to form gamma-glutamyl methyl ester residues [(PUBMED:9115443), (PUBMED:9628482)]. The structure of the Salmonella typhimurium chemotaxis receptor methyltransferase CheR, bound to S-adenosylhomocysteine, has been determined to a resolution of 2.0 A [(PUBMED:9115443)]. The structure reveals CheR to be a two-domain protein, with a smaller N-terminal helical domain linked via a single polypeptide connection to a larger C-terminal alpha/beta domain. The C-terminal domain has the characteristics of a nucleotide-binding fold, with an insertion of a small anti-parallel beta-sheet subdomain. 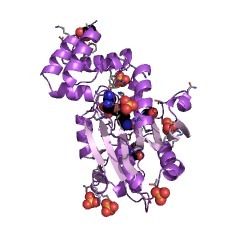 The S-adenosylhomocysteine-binding site is formed mainly by the large domain, with contributions from residues within the N-terminal domain and the linker region [(PUBMED:9115443)]. There are 23393 MeTrc domains in 23393 proteins in SMART's nrdb database. Taxonomic distribution of proteins containing MeTrc domain. This tree includes only several representative species. The complete taxonomic breakdown of all proteins with MeTrc domain is also avaliable. Click on the protein counts, or double click on taxonomic names to display all proteins containing MeTrc domain in the selected taxonomic class. Signal transduction processes commonly involve reversible covalent modifications of receptors. Bacterial chemotaxis receptors are reversibly methylated at specific glutamate residues within coiled-coil regions of their cytoplasmic domains. Methylation is catalyzed by an S-adenosylmethionine-dependent protein methyltransferase, CheR, that binds to a specific sequence at the C-termini of some chemotaxis receptors. From this tethering point, CheR methylates neighboring receptor molecules. We report the crystal structure, determined to 2.2 A resolution, of a complex of the Salmonella typhimurium methyltransferase CheR bound to the methylation reaction product, S-adenosylhomocysteine (AdoHcy), and the C-terminal pentapeptide of the aspartate receptor, Tar. The structure indicates the basis for the specificity of interaction between the chemoreceptors and CheR and identifies a specific receptor binding motif incorporated in the CheR methyltransferase domain. BACKGROUND: Flagellated bacteria swim towards favorable chemicals and away from deleterious ones. The sensing of chemoeffector gradients involves chemotaxis receptors, transmembrane proteins that detect stimuli through their periplasmic domains and transduce signals via their cytoplasmic domains to the downstream signaling components. Signaling outputs from chemotaxis receptors are influenced both by the binding of the chemoeffector ligand to the periplasmic domain and by methylation of specific glutamate residues on the cytoplasmic domain of the receptor. Methylation is catalyzed by CheR, an S-adenosylmethionine-dependent methyltransferase. CheR forms a tight complex with the receptor by binding a region of the receptors that is distinct from the methylation site. CheR belongs to a broad class of enzymes involved in the methylation of a variety of substrates. 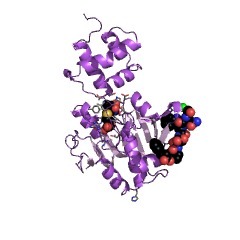 Until now, no structure from the class of protein methyltransferases has been characterized. RESULTS: The structure of the Salmonella typhimurium chemotaxis receptor methyltransferase CheR bound to S-adenosylhomocysteine, a product and inhibitor of the methylation reaction, has been determined at 2.0 A resolution. The structure reveals CheR to be a two-domain protein, with a smaller N-terminal helical domain linked through a single polypeptide connection to a larger C-terminal alpha/beta domain. The C-terminal domain has the characteristics of a nucleotide-binding fold, with an insertion of a small antiparallel beta sheet subdomain. The S-adenosylhomocysteine-binding site is formed mainly by the large domain, with contributions from residues within the N-terminal domain and the linker region. CONCLUSIONS: The CheR structure shares some structural similarities with small molecule DNA and RNA methyltransferases, despite a lack of sequence similarity among them. In particular, there is significant structural preservation of the S-adenosylmethionine-binding clefts; the specific length and conformation of a loop in the alpha/beta domain seems to be required for S-adenosylmethionine binding within these enzymes. Unique structural features of CheR, such as the beta subdomain, are probably necessary for CheR's specific interaction with its substrates, the bacterial chemotaxis receptors. Three-dimensional structure of CheY, the response regulator of bacterial chemotaxis. Homologies among bacterial signal transduction proteins suggest that a common mechanism mediates processes such as chemotaxis, osmoregulation, sporulation, virulence, and responses to nitrogen, phosphorous and oxygen deprivation. A common kinase-mediated phosphotransfer reaction has recently been identified in chemotaxis, nitrogen regulation, and osmoregulation. In chemotaxis, the CheA kinase passes a phosphoryl group to the cytoplasmic protein CheY, which functions as a phosphorylation-activated switch that interacts with flagellar components to regulate motility. 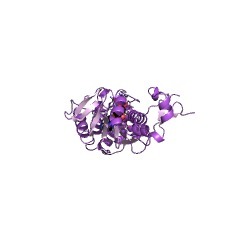 We report here the X-ray crystal structure of the Salmonella typhimurium CheY protein. The determination of the structure was facilitated by the use of site-specific mutagenesis to engineer heavy-atom binding sites. CheY is a single-domain protein composed of a doubly wound five-stranded parallel beta-sheet. The phosphoacceptor site in CheY is probably a cluster of aspartic-acid side chains near the C-terminal edge of the beta-sheet. The pattern of sequence similarity of CheY with components of other regulatory systems can be interpreted in the light of the CheY structure and supports the view that this family of proteins have a common structural motif and active site. Purification and characterization of the S-adenosylmethionine:glutamyl methyltransferase that modifies membrane chemoreceptor proteins in bacteria. The enzyme (EC 2.1.1.24) from Salmonella typhimurium that catalyzes the S-adenosylmethionine-dependent methyl esterification of glutamyl residues in membrane chemoreceptor proteins has been purified to homogeneity, and the nucleotide sequence of the gene coding for this protein, cheR, has been determined. The molecular weight, amino acid composition, and N-terminal amino acid sequence of the purified protein correspond to the values predicted from the sequence of the gene. The pure protein is a 33-kDa monomer. Kinetic studies indicate that, at levels of receptor and S-adenosylmethionine present in wild type cells, the transferase is nearly saturated. The enzyme has a relatively low turnover number, approximately 10 mol of methylester formed per mol of enzyme per min; and there appear to be only approximately 200 methyltransferase monomers per wild type cell. This information is based on mapping of SMART genomic protein database to KEGG orthologous groups. Percentage points are related to the number of proteins with MeTrc domain which could be assigned to a KEGG orthologous group, and not all proteins containing MeTrc domain. Please note that proteins can be included in multiple pathways, ie. the numbers above will not always add up to 100%.